Sunday mornings can go one of two ways in my eyes: productive or lazy. This particular morning, Jonathan and I decided to get up early and make it a productive day. I decided to start my day in the kitchen with a few ingredients we had on hand: Breakfast Sausage, Eggs, Spinach and Sweet Peppers. Looking for a weekend breakfast? Save it to Pin! My new favorite thing to buy at the grocery store is those small bags of sweet bell peppers, have you seen them? The peppers are very small, colorful and most importantly, not spicy at all. They have a great crisp flavor whether you are eating it raw or sautéing them. I usually slice the tops and bottoms off, and continue to slide them down their center. I almost rarely remove the seeds because they don’t really effect the overall taste of the final product. Plus, some of them are very small and it would be a little time consuming. Nothing says breakfast than farm fresh eggs. And when I mean farm, I mean in my backyard fresh eggs. Jonathan’s family has had chickens for a couple of years now so we always have eggs in stock. I added a little bit of spinach to the mix to brighten up the eggs and give the dish a little more moisture. 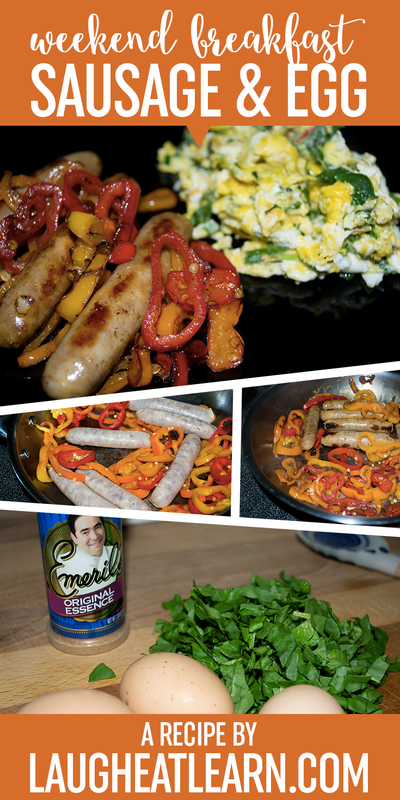 The Emeril seasoning is one of my favorites to use with eggs. It gives the eggs a little sweet and tangy flavor and saves me from over seasoning with salt and pepper. So, what is your go to Sunday morning meal? I would love to know more so I can try some new ones out! If you found this recipe tasty and want to share/save for your friends, pin the image above and enjoy! Heat your sauté pan on medium heat with the olive oil. Move the oil around so it covers the bottom surface. While the pan is heating, slice the tops and bottoms of the peppers, and slice them length wise, creating ringlets. Add these to the hot pan, it should sizzle, and add salt and pepper to help them along. Get your second pan ready on medium heat with some cooking spray. I use a small non-stick egg pan. Chop the spinach into small bite pieces and put aside.3. Continue to stir and move the peppers around until they start to glisten and soften, about 5 minutes. Add the sausage directly to the pan with the peppers, making sure the sausage touches the bottom of the pan with the peppers around it. Cook the sausage as normal, browning the sides. Add your eggs to the pan, top with spinach and seasoning. You can choose the manner in which you want your eggs. I scramble them in the pan as they continue to cook. When the sausages are nicely brown, add the water and stir everything around. Make sure to scrap the bottom of the pan for drippings to add to the "sauce". Cook off the water so there is not much left. Transfer the eggs and sausage to your plate and ENJOY!